Every mathematician is a person with a story. 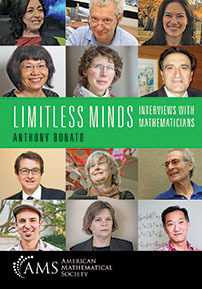 Limitless Minds tells those stories in an engaging way by featuring interviews with twelve leading mathematicians. They were invited to answer some key questions such as: Who and what were the influences that pointed them towards mathematics? Why do mathematicians devote their lives to discovering new mathematics? How do they see mathematics evolving in the future? The book, written in an accessible style and enriched by dozens of images, offers a rare insight into the minds of mathematicians, provided in their own words. It will enlighten and inspire readers about the lives, passions, and discoveries of mathematicians. Undergraduate and graduate students and researchers interested in interviews and mathematicians.